Some fish never get the respect they deserve. The stars of the angling show are bass and walleyes. We see them on television, on the covers of outdoor magazines and in our local newspapers. Sometimes, however, fishing isn't about old glamour gills. It's about spending a few hours on the water. It's about feeling a tug on your line. It's about sharing a day full of laughs. Maybe it's about bragging rights and the camaraderie among a group of anglers less concerned with the final results than the common experience. And for the sheer pleasure of fishing, it's hard to beat the homely, hard-fighting sheepshead. They are members of the drum family and a freshwater version of the redfish that have become so popular in saltwater tournament circles over the past few years. In some bodies of water, they live as long as 70 years or more. Their range expands to nearly every significant body of water throughout the Midwest, and they can be found in good numbers up and down the Mississippi River. They will eat almost anything, but prefer a balanced diet of mussels, baitfish, crawlers and macroinvertebrates. They even make decent table-fare when cared for and cleaned properly. Keep the smaller fish in the 1- to 2-pound range, get them on ice immediately and remove the lateral line when you clean them. Many anglers insist you won't be able to tell the difference between sheepshead and walleyes when they come out of the frying pan. Three things stand out about sheepshead. First, they talk to you. They possess an adapted swim bladder that enables them to produce a sort of groaning sound believed to be important in spawning activities. Thus, they've been tagged with nicknames like grunts, grinders and croakers. Second, they feature distinct otoliths in their heads. Casually referred to as "stones," these inner-ear deposits of calcium-like material were once treasured by Native Americans for jewelry, currency and good-luck charms. Third, sheepshead are one of the hardest-fighting fish and easiest to catch that swim in freshwater, which makes them a perfect target for anglers of all ages and abilities. However, they will test your gear and if you catch enough of them, your endurance, as well. Locating sheepshead isn't difficult. Nearly every walleye angler has at some time encountered sheepies. They frequent similar habitat. While you are likely to find them nearly anywhere you fish for walleyes, large concentrations tend to gather along sharp breaklines or dropoffs where rock or rubble is present. Catching them isn't difficult, either. They'll eat jigs, nightcrawlers, crayfish and even crankbaits. 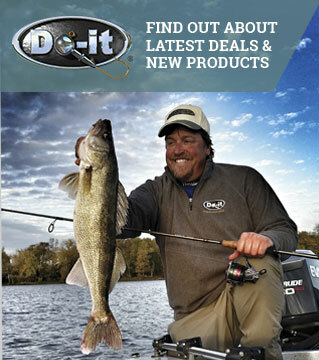 With a handful of tackle you can craft from Do-It Corporation products, you'll have your hands full with fish that often make your reel sing as they head for deep water. If you are into jig-fishing, think small. Sheepshead don't have large mouths, and the location of their pieholes makes it difficult for them to gobble up larger jigs. In fact, they will usually pick the bait up off the bottom, although now and then they will whack a jig like some of their more popular gamefish cousins. Bucktail jigs and hair jigs work, as do jig heads tipped with a half-crawler. Pitch them on top of the dropoff and work them slowly and methodically down the break. After you've picked off the most active sheepies, you can go back and vertical jig the bottom of the break for more action if you're not already worn out. If jigging isn't your style, live-bait rigs are another productive option that can be fished from shore or from a boat. Slide an egg-style or walking sinker onto your line, attach a barrel swivel and follow that with a 3- to 4-foot leader and a plain hook. Tip it with a crawler or crayfish and you're in business. A friend and I recently participated in the 6th annual Sheepshead Classic in the small Mississippi River town of Nelson, Wis. While our angling pursuits typically target species like bass, walleyes and panfish, seldom have we had more fun during a day on the water than we did that day. Beginning at 5:30 a.m., we caught 17 sheepshead by 6 a.m. By noon, we figured the count to be nearing 100. We fished through an hour-long downpour and caught sheepies. We battled a 20-25 mph wind and caught more sheepies. We tied one hand behind our backs and caught sheepies (just kidding). Our forearms were knotted, our hands sore and our shoulders aching by the time we called it quits about 1:30 p.m. and headed for shore and a shower. The contest allowed each team of two anglers to weigh in 10 sheepshead. Ours tipped the scales at a collective 63 pounds with a pair of 9 1/2-pounders highlighting our catch. That's a great day on the water!